Tonight and Tomorrow: Showers will continue to slow down as we progress into the evening, leading to drier conditions by 8 PM. Clouds will linger, but will also begin to break as we head into the overnight hours. That will lead to temperatures cooling quickly late, reaching an overnight low of 72°. 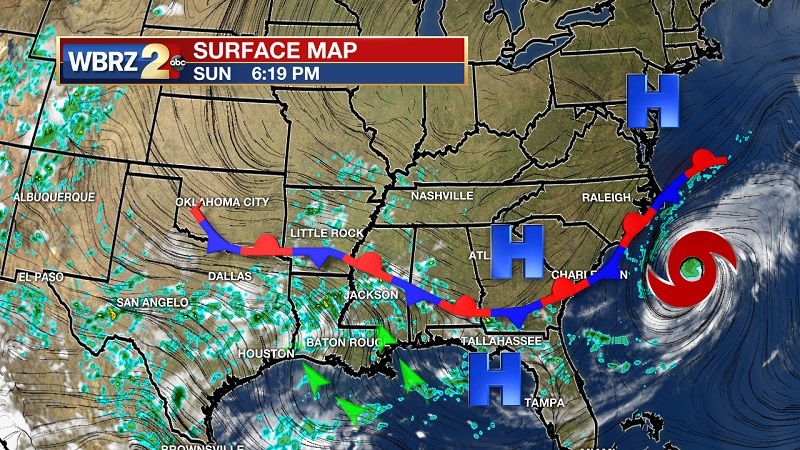 Scattered afternoon showers and storms to continue into Monday, as the high pressure offshore of the Florida Panhandle has been slow to move west. Showers will begin isolated around noon, and should turn more scattered after 3 PM. The high will finally make it closer as we make into the evening, as drier conditions will ensue by 8 PM. Temperatures will warming quickly through the morning, eventually reaching 90° for our high during the early afternoon hours. Temperatures will stay in the 80s through most of the day, dropping into the 70s around 10 PM. Up Next: High pressure finally reaches the Louisiana Coast in the early morning hours on Tuesday, helping to provide a break in the showers. Afternoon isolated pop-up showers will still be possible, but they will be rather spotty in nature. This period will not last long, as the high degrades and another trough sets up from the north to bring scattered showers and storms across the area. This weather pattern is likely to stick around through the week and into the weekend. Tropical Storm Beryl is no more. The remnants of the storm are located about 60 miles northeast of Martinique and 70 miles east-southeast of Dominica and moving quickly toward the west-northwest at 26 mph. Maximum sustained winds are 45 mph, which is within tropical storm status, but there is no closed rotation at the surface which is necessary for tropical cyclone classification. 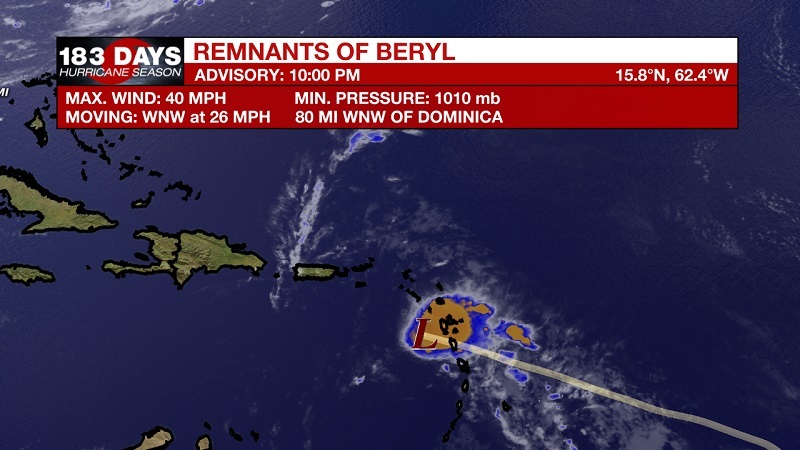 Beryl will move across the Leeward Islands and south of the Virgin Islands and Puerto Rico on Monday. There is a slight chance (30%) of re-development within the next 5 days, with the best chance just north of Cuba. We will be keeping our eyes trained at this system as it traverses the Caribbean. 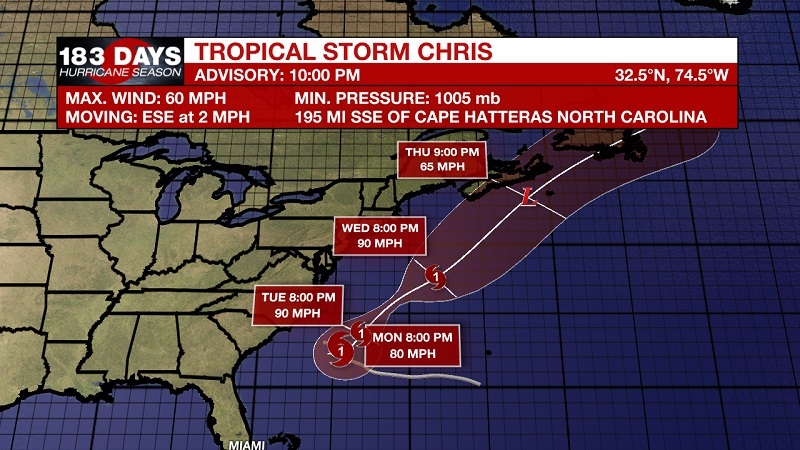 Tropical Storm Chris formed early Sunday morning, and is spinning 180 miles south-southeast of Cape Hatteras, North Carolina, with sustained winds of 50 mph. He has not moved much in the last 24 hours, and is not expected to over the next 2-3 days. In that time, he is expected to intensify to hurricane status on Monday, and stay a category 1 storm until Wednesday as he travels northeast from his current location. He will stay well offshore, so only elevated rip threats are expected for the East Coast through the week. The high pressure center offshore of the Florida Panhandle has had a tough time keeping strength and breaking away to the west. Eventually, the high will win the war and travel west along the Gulf Coast late Monday into early Tuesday. This delay will keep scattered showers and storms on the menu for Monday, but Tuesday will see much drier conditions as the high moves onshore the Louisiana Coast. The high will not stick around long, as an upper level trough will set up from the north on Wednesday. This will bring back the moisture machine, leading to scattered showers and storms through the rest of the week. Temperatures will stay at or below average through this period, but muggy conditions will linger through the evenings.